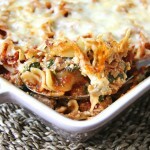 This Ground Chicken & Spinach Noodle Bake has delicious layers of noodles, meat sauce, vegetables and cheese. It’s kind of like a lazy, but lazy-fancy lasagna. Cook your noodles according to package directions. Set aside. In a skillet warm the 1 tbsp olive oil, then add the onions, garlic and mushrooms and saute until soft. Stir in the fresh spinach, then transfer the mixture to a mixing bowl and set aside. In the same skillet you used to cook onion mixture, cook the ground chicken with the chili flakes and salt & pepper. Add the cooked chicken mixture to the spinach mix. Stir in the cooked and crumbled bacon, ricotta cheese and parmesan cheese. In a large baking dish (9×13) spread half of the chicken/cheese mixture onto the bottom of the dish. Layer on half of the noodles. Spread on half of the pasta sauce. Add the remaining chicken mixture. Sprinkle on the shredded mozzarella cheese.